The view from the hill. Reservoir no longer there. Park officially open. 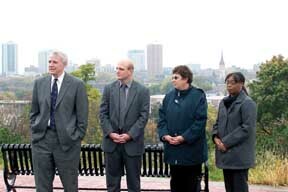 Mayor Tom Barrett joined Third District Alderman Nik Kovac, Water Works Director Carrie Lewis and Sixth District Legislative Assistant Akuwa Dantzler in celebrating the opening of the revitalized Reservoir Park – a new public green space with a million dollar view. Lewis cautions that the grass and plants are not fully established, and asked visitors to please stay on the paths. So many late-night visitors were breaking through the fences that Lewis thought it best to quietly take them down so the public’s eyes could help monitor the space. Mayor Barrett commented that he drove by recently and saw the fences down. The secret was out. He wanted to recognize this great addition to Milwaukee and our neighborhoods, and a small ceremony was organized for 11 am on Friday, Oct. 24. Alderman Kovac stated that he was happy to support this project along with Sixth District Alderwoman Milele Coggs. He noted that the park is in the Sixth District, but all the homes that face the park on Meinecke Avenue are in the Third District. Kovac noted that the story of the reservoir and its future was on the cover of the first issue of the Currents in February of 2002. The planning process and implementation took almost seven years. 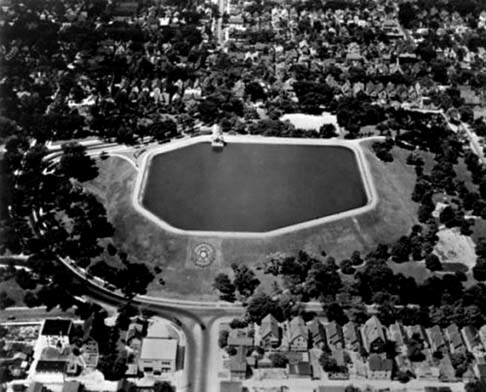 Photo at right shows the reservoir as it appeared as an open water storage system in the 1950’s. It was capped in the 1960’s. Over the last two years it was decommissioned, removed and landscaped as a park. The access stairs and paths enter from North Avenue, Bremen Street and Meinecke Avenue.